It’s high summer, so last week I jumped at the chance to make faithful reader Katerina’s beautiful jam recipes from her native Athens, Greece. With its average summer temperatures in the low 90s (F) and very little rainfall, local fruit has the chance to go all Greta Garbo on the vine or tree and just get sweeter by the day. People who are used to such luxuries know how best to enjoy them, so like a good girl I followed Katerina’s recipes to the letter. I made this recipe because I found myself with lots of melons. I have done many attempts to find the best way of treating the fruits. Please have in mind that the taste of the jam depends on the variety of the fruit. I do not give exact quantity of sugar since the fruits can be very sweet. The best approach I have found is to melt the fruits in a food processor and add sugar in small quantities, let it dissolve and taste the result. When satisfied, put the mixture of fruits and sugar in a heavy-bottomed saucepan and let it boil at medium temperature, stirring occasionally. Add 1 tablespoon of lemon juice per pint of jam. When thick, it is ready. Put it in sterilized jars, turn them upside down in order for them to be sealed, and during the winter you’ll have a taste of summer. Me again. It’s true that you won’t know what the jam needs until you taste the fruit, and it can vary pretty widely. Melons are desert natives. Here in temperate NJ, if the summers are sunny and dry and Gobi-like, our local melons are better than a candy store. But if we get too much rain, they’ll taste like their cucumber cousins and depress the crap out of your peanut butter sandwich. I used a really ripe, local, organic cantaloupe. If you can do the same, I heartily endorse it. Unless your supermarket carries local melons (and read the fine print on what they consider local; it still might be from 1,892 miles away), they just aren’t going to have the sweetness and character of fruits that were grown close by and allowed to ripen on the vine. Mine needed only a bit of sugar. I added some fresh grated nutmeg, too. ** It cooked down to a luminous orange and tasted remarkably of pumpkin (another cousin). But it’s a more cheerful version of pumpkin, as pumpkin would taste after getting the top car on a Ferris Wheel and swinging it back and forth, much to the consternation of its little sister. The next jam is even yummier. I make peach goo*** every summer, but loved the idea of adding stuff that hadn’t occurred to me. Wash fruit. 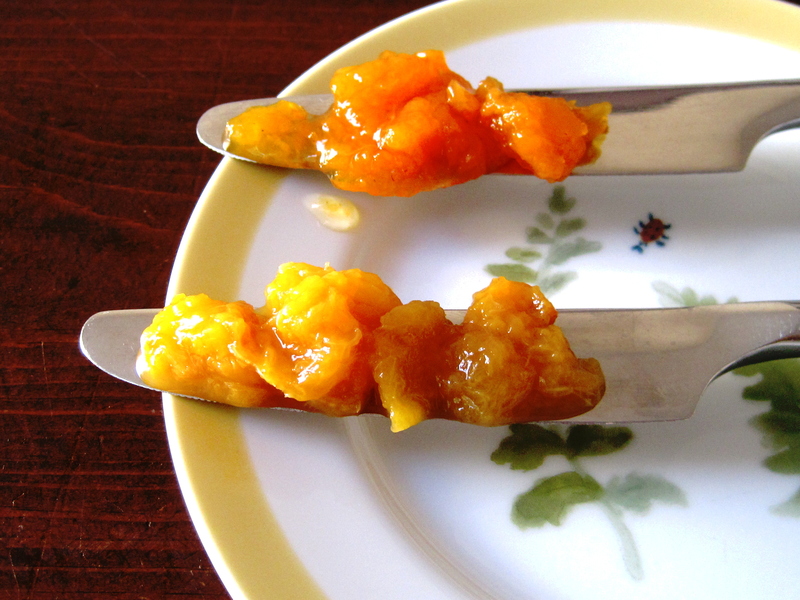 Cut peaches into small pieces and crush them lightly with a fork. Peel and then grate the ginger on a coarse grater. Put the peaches and ginger in a saucepan with a thick bottom and sprinkle with sugar. Allow to soak in the juice until sugar is completely dissolved. Place the pot over high heat and add the spices and lemon juice. Allow to boil 5 minutes, stirring continuously with a wooden spoon and removing the foam from the surface. Lower heat and let boil for 3-4 minutes more. Remove the foam and cinnamon sticks and fill sterilized jars with the hot jam. Shut tight and push up the lids. Turn the jars upside down till the jam reaches room temperature. At the tippy top of the post are the peaches I used. 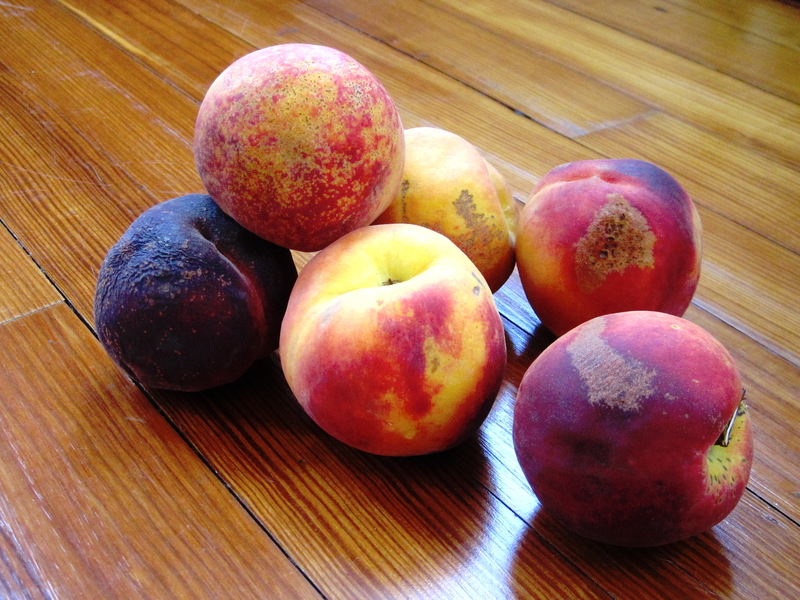 They’re local, ‘light spray’ (it’s hard to find an organic peach in NJ), and look the way peaches look when the farmer doesn’t fuss over them. Russeting and some marring is good. In my many years of picking and eating peaches, I can say with some authority that the ones that are a little rough around the edges will be sweeter. The difference in flavor is striking enough that last year I blogged about it here. The peaches cook down to an mellow-tasting amber mixture, and the spicy hit of fresh ginger, then cloves and cinnamon, is surprisingly fun. I’ve been eating this stuff out of a Tupperware for the past week. Both recipes are good on sandwiches, on toast, or on the fantastic bagels brought by your summer visitors from the city. Bonus: They can be made after a day of fun at the beach, or dreariness at the office, or vice versa, allowing you to go all Greta Garbo—a perfectly acceptable way to be this time of year. Melon (cantaloupe) at top; peach ginger at bottom. *Absolutely true, and in NJ, September melons can be even better. **Angie Wink, that one’s for you. ***Sometimes jam, sometimes compote, we had this discussion. I learned a lot as I researched this post; mainly, that I need to make the radical decision to do all of my research early—like, say, before shooting. If I had, I would have made sure the lilac blossoms below were shot with the ones above. The way it is now, they look like they threw a Lego in the classroom and I put them in timeout. Anyway. Part 2 of the edible wild series! 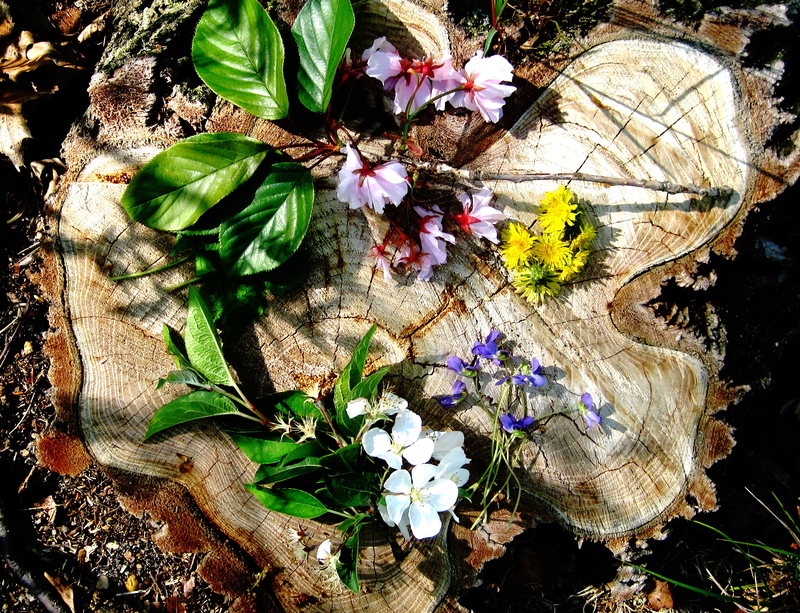 The sun’s getting closer, it’s greening everything up, and lots of flowers that are blooming now are edible. 1) Be sure that what you think you’re picking is what you are in fact picking. 2) Don’t pick from roadsides because dogs have a singular way of worshiping beauty in nature. 3) Don’t pick off other people’s lawns unless they’re pals who definitely don’t use pesticides, and besides you made them devil’s food cake pops last New Year’s Eve and they never said thank you. Cherry trees are in the Rose family. Look closely at a wild cherry blossom and a wild rose blossom; you’ll see the former looks like the latter’s kid sister. Pickled cherry blossoms and leaves are a treat in Japan, where an affinity with cherry trees is a sweet part of their nationalism. Note: Eat cherry leaves sparingly; they’re toxic in high amounts. I caved and included dandelion blossoms in this post despite the aggravation they gave me a few weeks ago while shooting my first ‘edible wild’ post. Today’s post needed a good blast of yellow, for which they should thank their lucky stars. Blossoms can be eaten raw (fun in salads), or battered and fried. To me they taste grassy and slightly sweet. Violets are the cutie patooties of the baking world these days, especially when sugared and arranged on top of cakes. This practice admittedly smacks of Martha, which isn’t always appealing, but in this case it works. A couple of purple or white violets, which have a teeny splash of purple in the middle, look really cool on a cupcake. I’d heard that violets have a peppery flavor, so I tried one this afternoon to check. It didn’t. Just tasted grassy. Then I thought I tasted a slight, late-in-the-game pepperiness, but it’s just as likely that the garlic I had at lunch was messing with my head. Don’t have garlic for lunch one day, taste a violet and tell me the deal. Their cousins are edible as well—the pansy tastes grassy and the Johnny-Jump-Up tastes like wintergreen. Blossoms and leaves are both edible. 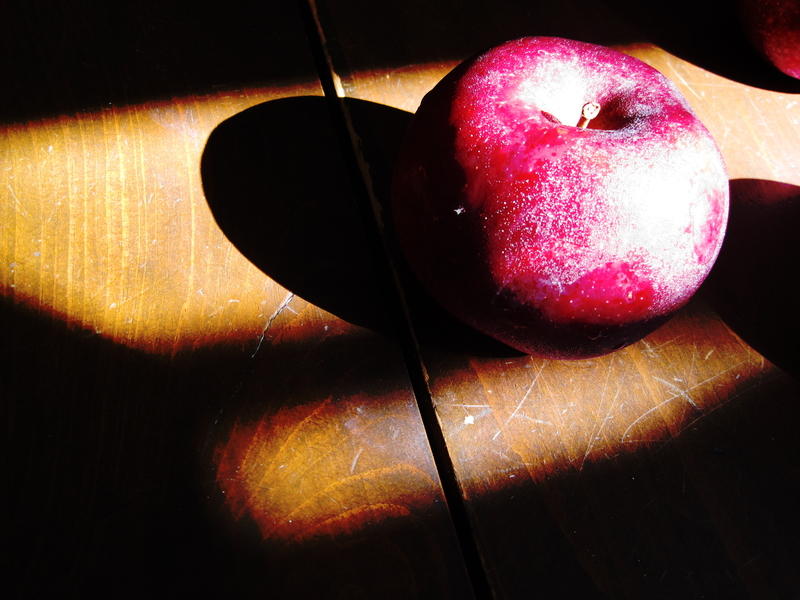 The apple is another member of the Rose family, and their blossoms are similar as well. These blossoms have a light, delicate flavor. The twig shown was clipped from one of the wild trees that grow around the lake and provide the crab apples for my yummy jam every fall. I’ll admit I wouldn’t have known the lilac’s blossoms were edible if I hadn’t browsed around Anthropologie last Thursday and seen a book on recipes for edible flowers. Okay. 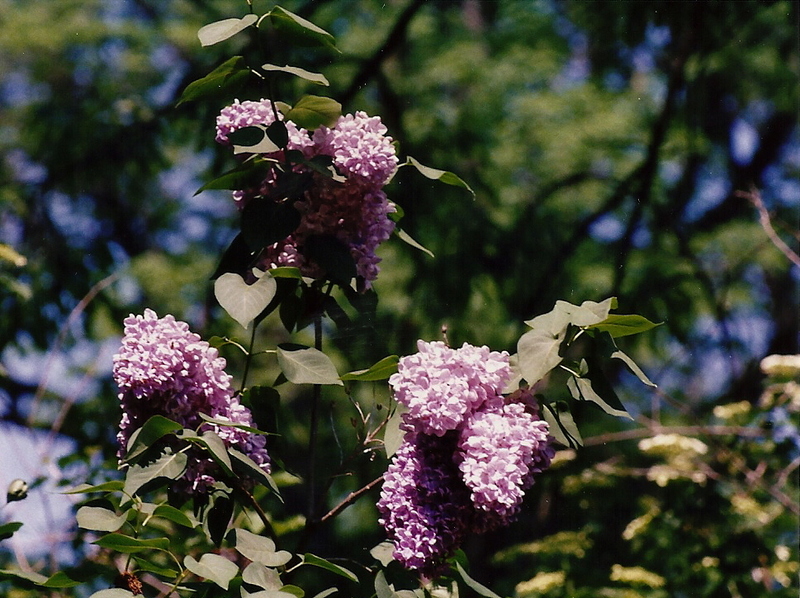 Intensely fragrant lilac blossoms can serve as a base for homemade syrups, jellies and infusions. But remember they’re like your great aunt who lives in Boca—she never, ever forgets your birthday, but smells as though she takes morning laps in Givenchy Dahlia Noir. A little goes a very long way. Last summer my neighbor, a lovely English lady, flattered me by asking if I would edit her family recipe for Traditional English Christmas Cake. She considers it an heirloom; and in the hopes that her children and grandchildren would make and enjoy it for years to come, she wanted it to be as clearly written as possible. I edit recipes often for the magazine I work with, but the prospect of doing this gave me chills—good ones. Start with the fact that I am an Anglophile who has seen many recipes for this iconic cake but have never tasted it. Next, add in the fact that my neighbor is a graduate of London’s Cordon Bleu; she actually made Coronation Chicken for ambassadors and dignitaries for the Queen’s coronation in 1953. Wow. Lastly, throw in the history of the recipe, which goes back centuries. (To give you an idea of how far back I’m talking, a variation calls for 12 marzipan balls to be placed on top, and some historians believe they represent the 12 Titans.) This recipe is a piece of living history, and I was offered the chance to be a part of it. I couldn’t wait. My neighbor asked that I get the edited recipe back to her sometime in the fall, so in early October I delved into it. She was very happy with my edits and reformatting. Last week she gave me a slice of the fruitcake, which she had made for a garden club holiday party. It was like nothing I have ever tasted, surprising and complex. And a couple of days ago, I made the cake for myself—a little version of it. The recipe predates refrigeration by hundreds of years, back when brainy and resourceful women figured out how to make food last. This is an example of what they learned. We know adding alcohol to foods preserves them. Here, the extra addition of a double layer of icing to the cake acts as a yummy edible Saran Wrap, helping it to stay fresh for a good month. The first thing you do is roughly chop up dried fruits, like fancy raisins, cherries and unsulfured apricots, and soak them in brandy overnight. Or you can use fruit juice. The next day you make the cake batter and mix the fruit into it. My neighbor said to use only dark colored fruits because it’s supposed to be a dark cake (hence why I used unsulfured apricots), and indeed it is; the addition of brown sugar and a bit of molasses to the batter helps keep it dark, too. Once baked and cooled, you release the cake from the pan and put it on its serving plate, tucking strips of parchment underneath. This way, after you’ve iced it, you can pull the strips out and discard them. Your plate stays clean as a whistle. Next you roll out some marzipan (I used my own, but a good quality store bought brand like Odense works, too) that you’ll use to cover the top and sides of the cake. Set it aside for a minute. Then put some apricot jam and a little water into a saucepan and heat it up so the jam loosens and becomes syrupy. That gets brushed on top of the cake, then you cover it with your marzipan. Here’s how mine looked. It’s a bit of a patch job, but this is home cooking. And Martha I ain’t. Royal icing comes next. I have never made it before and was amazed at how easy it is. You put a couple of egg whites into a bowl, beat them a bit, then add confectioners’ sugar spoonful by spoonful until you get the consistency and amount you like. That’s it. If it gets too thick, add a little lemon juice or milk. Mine was almost as gooey as honey, thin enough to pour. I used an offset spatula to coax it down the sides and made sure all surfaces were covered. Royal icing dries at room temperature, or I should say the top of it dries to a delicate crispness, like the top layer of newly fallen snow. Underneath it stays a bit creamy and soft. Luscious stuff. If you come from the south of England, you decorate this cake with lots of Christmasy embellishments. If you come from the north, you decorate sparingly or not at all. My neighbor friend is from the south, so I followed her lead. Below is the cake just after I put on the icing. I put the little bottle brush trees on at this point so their bases would stay affixed to the top of the cake. I’ve been making marzipan animals for years, but they’re always somewhat stylized, less realistic. They’re also quite a bit larger. I have never worked so small as I have here: the largest figure is 1.5″ and the smallest is just 3/4″. But when I started thinking about how to decorate the cake, the thought of making this little woodland scene jazzed me. I loved the challenge, and I love working with my hands. This is something I really needed, especially after the grueling past couple of months. Made me feel human again, like myself again. This morning I had a little piece of the cake. The allspice, cinnamon and freshly grated nutmeg are what come through first, heady and wonderfully fragrant. I didn’t taste a whole lot of the alcohol, but that might be because I have a dopey oven, and when I turned the temperature down from 325 to 295 as the recipe instructs, the cake finished baking before it made it to 295. So most of the alcohol probably burned off, and the cake was less moist than it should have been, but I still love it. I was worried that the marzipan and royal icing that covered the already sweet cake would make it molar-looseningly cloying, but I was surprised to find that they were less sweet than the cake, and actually mellowed it. And it was a little piece, not a big one. My neighbor tells me another reason why Americans aren’t fond of fruitcake is because we’re used to cutting cake in large slices and eating the whole fat slice. But this cake is very rich, very intense. It is not meant to be cut the way you would a Bundt cake. It is meant to be cut in what she called ‘fingers’, in inch-long lengths, the way my mom cuts a slice of banana bread into fifths. That’s all you want at one time from this cake; a little goes a very long way. Which is good because you’ll want the cake made from this ancient recipe to last, you’ll want to have some to nibble on each day as you watch the sky darken, as our ancestors did before us. Post script: This is my 100th blog post! Thank you for reading, and I’m looking forward to playing with my food, with you, as long as I can. Goodness, this was a lousy week. Even before the tragedy in Connecticut on Friday I was overwhelmed, disheartened and in need of some peace—proper peace, the kind that soaks into the bones. The song ‘Where Are You, Christmas?’ has never been a favorite of mine, but I have to admit that lately I have been wondering the same thing. Here it was the middle of December, and I should have been happily knee-deep in the fun and joy of Christmastime. Instead, stress seemed to have formed a Plexiglas case around me, isolating me from the season I love so much, allowing me to see it but not feel it. It was as if I was watching it all on television. By Wednesday I was stretched to maximum capacity and utterly exhausted. I crossed everything off my list for the afternoon, drove to the antique district in Red Bank and walked into the red wooden shop at Front Street and Bridge. My blood pressure went down to a simmer as soon as I opened the door of the old building, a mighty garage sale on two floors. It’s a good place to step out of yourself, out of the present, into what (at least) feels like a warmer time. The place even has a calming aroma; the mix of wood, vintage clothes, books and housewares all together in one spot is what I imagine 1958 or thereabouts smelled like. This antiques shop relaxes me because the stuff within is not so much precious as homey. There are the odd mahogany end tables and gilded mirrors, but there are far more simple things, ones that waft good memories around me like a May wind. I love seeing the type of 1960s porcelain figurines my aunt used to display on her dresser, the ones of ladies with updos, wearing broad sweeps of black liner on their upper eyelids and real dangling earrings. I love seeing the same miniature Madame Alexander dolls I used to collect, and the kind of metal lunchbox my sister used to carry to school. The vintage kitchen stuff soothes me most of all. The nooks and alcoves piled floor to ceiling with kitchenware are quiet places where you can step in and feel enveloped by women, long-gone, who imprinted themselves on the worn goods they left behind. Here the potato masher and wooden spoons with well-used handles, there the scratched ceramic bowl in which of hundreds of loaves of bread rose. Corningware dishes that saw countless Thursday night meatloaves, birthday-dinner chicken fricassees, heaps of peas from a carefully tended garden. Within these humble, common possessions were the spirits of generations of women who worked their whole lives to keep their families well fed and protected. I felt that spirit, decades later, and felt the safety they provided transfer to me. Depression glasses and plates are stacked by color, and they make muted rainbows on the shadowy parts of the shelves. Utensils are in spatterware buckets and inside drawers of wooden hutches. The place is a mishmosh, granted; but there IS order, there IS a layout, and I found that comforting, too. What Holly Golightly appreciated about Tiffany, I appreciate here. I liked these as a kid, but my mom wouldn’t let us get them because she heard a rumor that they contained lead. Was that true? Jadeite vases, coffee cups and bowls. Enamelware soup ladle, made to accommodate a deep stock pot. Christmas decorations are all around the shop, too, most from 1960 and earlier. I loved peering into the cabinets full of candle choirboys, never lit so they would always stay perfect, and grinning Santas. My mom has Christmas things she loves putting on windowsills every year, and so do I. I imagined the sweet-faced angel below being someone’s mom’s favorite. And once again I felt enveloped and safe, even though it was through an image of someone I had never met, from a time before my time. It didn’t matter that it didn’t make sense on paper; it worked. Many years ago I was at this very shop and fell in love with a tiny bottle brush Christmas tree. I came back a couple of days later to buy it and it was gone. Amazing how the loss of something that cost three dollars could have made my heart sink like it did, but it did. On Wednesday I turned a corner and saw another bottle brush tree. At just two inches, it was tinier and even cuter than the one I lost all of those years ago. Three and change. Done. I stayed for an hour and left the shop feeling much looser and calmer. Yes, the rest of my week got hairy from time to time, and I’m sure it will again. But I have my little bitty tree right here on my desk, and it helps to remind me of the joy and peace this season is supposed to have. I’m not sure I believe in sweeping generalizations like great joy is all around us, if only we reach out and grab it. Would that it were. At times like this it seems even more implausible, and that’s coming from a pretty enthusiastic optimist. But I don’t think that’s how it works. Instead, I think we should seek out any bright little glimmers of joy we can find. Those are all around us, and those we should grab. It doesn’t matter if it’s Christmastime or any other time of year. Hang on to them and let them sink into your bones. They’ll fortify you. When necessary—before it’s necessary, really—I recommend taking a day, or an afternoon, or even an hour, to play hooky from the world. And I figured this out: Maybe stress is best diffused just by seeking out anything or anyone that can help us to feel safe. Maybe that’s where peace comes from, too. I hope you figure out a way to find it—all year long but especially now. If the apple were to post a listing on match.com, it’d get dozens of hits because it has it all—looks, personality and versatility. 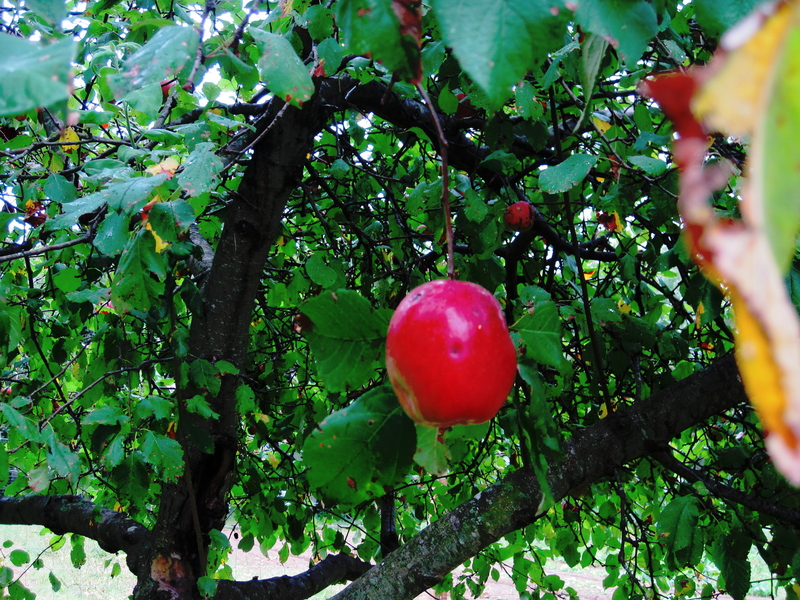 This pictorial features the glorious apple in the height of its season. All shown are organic, and what’s more, none ever saw the inside of a supermarket. 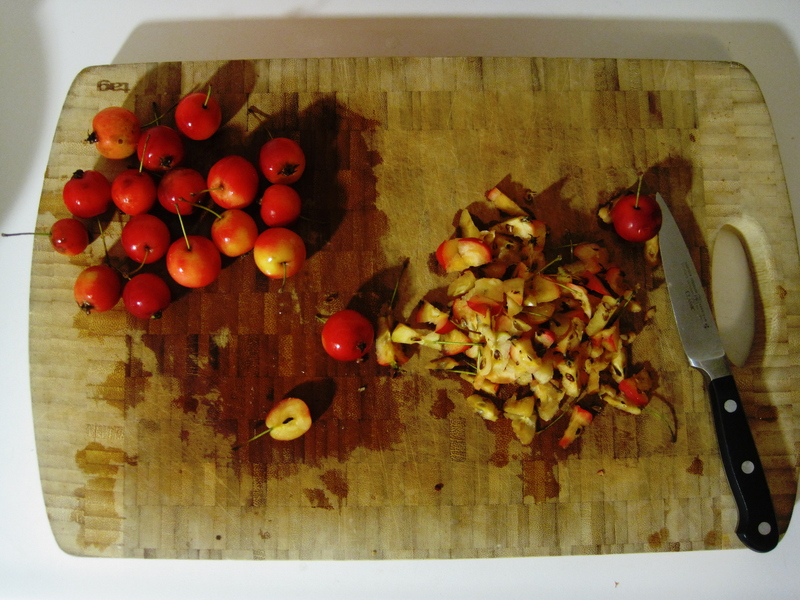 The small apples are crabapples, which I picked from a tree in my town. 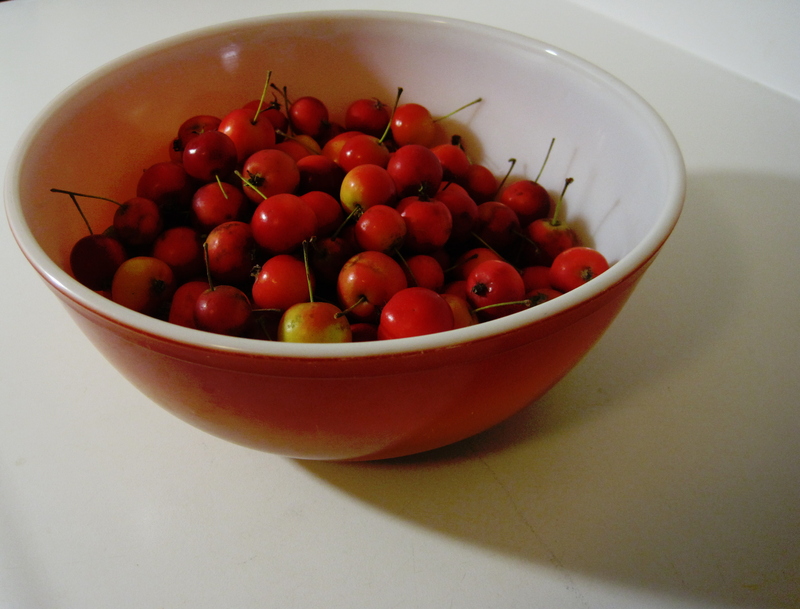 I know of five crabapple trees within walking distance, some planted and some wild. They are all alongside the lake, and thus the EPA dictates that they cannot be sprayed. As is always the case, while I was picking, someone stopped to ask what they were, what they tasted like (very tart), and what I was going to do with them (make jam. And another day, schnapps). 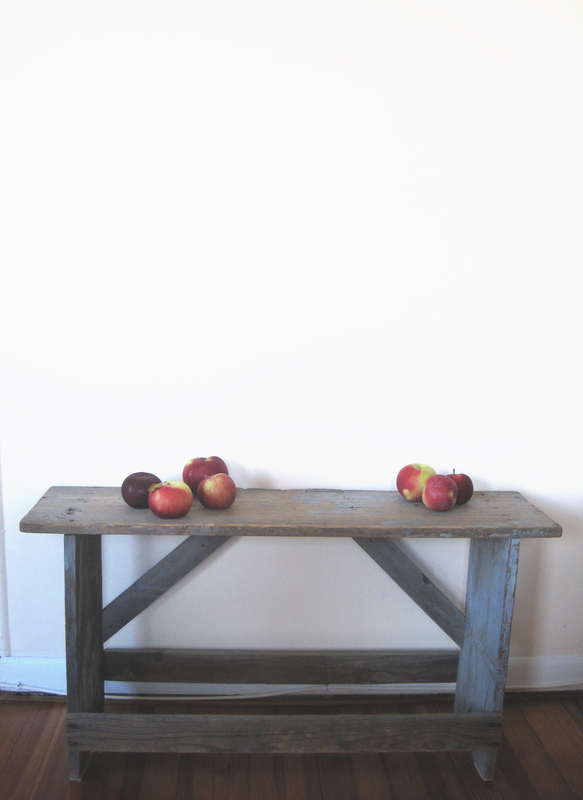 The large apples were purchased from Tom Nivison at Silverton Farms. The splotchy red ones are Empires and the green ones are Mutsus. I think the deep red ones are Romes. The apple trees in the photos are Tom’s own: ‘Liberty’ and ‘Freedom’. ‘They look like hell, but they taste great,’ he said, as he polished one on his shirt and took a bite. He’s right. 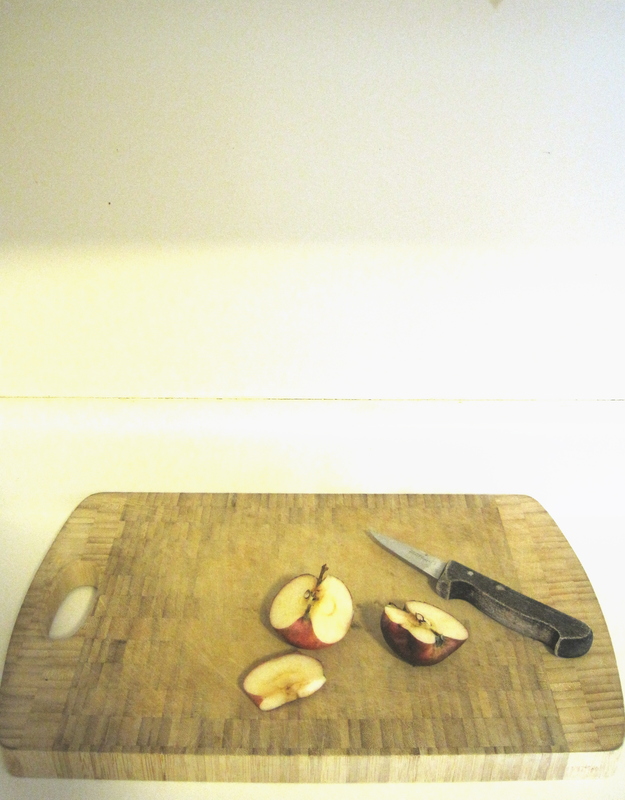 I took a ‘Freedom’ home in my pocket (that’s the sliced apple on the cutting board) and it was my ideal combination of floral sweetness with a little bite of tartness. 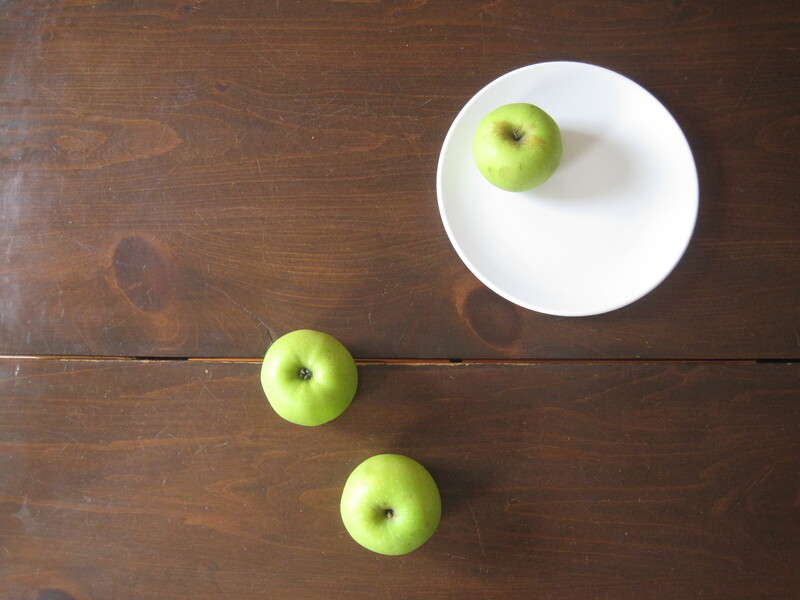 Jump at trying a new apple whenever you come across one; go for something different than the usual suspects (Red Delicious, Golden Delicious, McIntosh, Granny Smith). 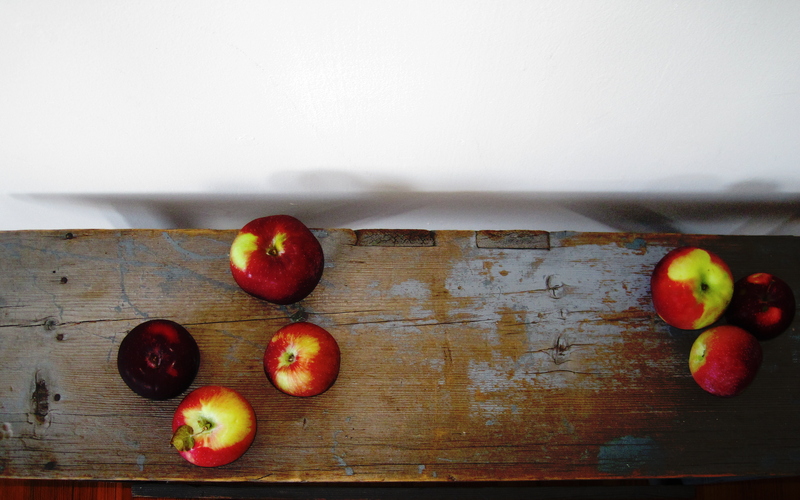 Every now and again at a farmers market or a specialty store you’ll spot a bin of dinky little Lady apples (great for caramel apples for the little ‘uns) or better yet, an heirloom variety you’ve never heard of before. Crunch into it and let a wave of adjectives (or colors, or whatever) swirl through your mind. 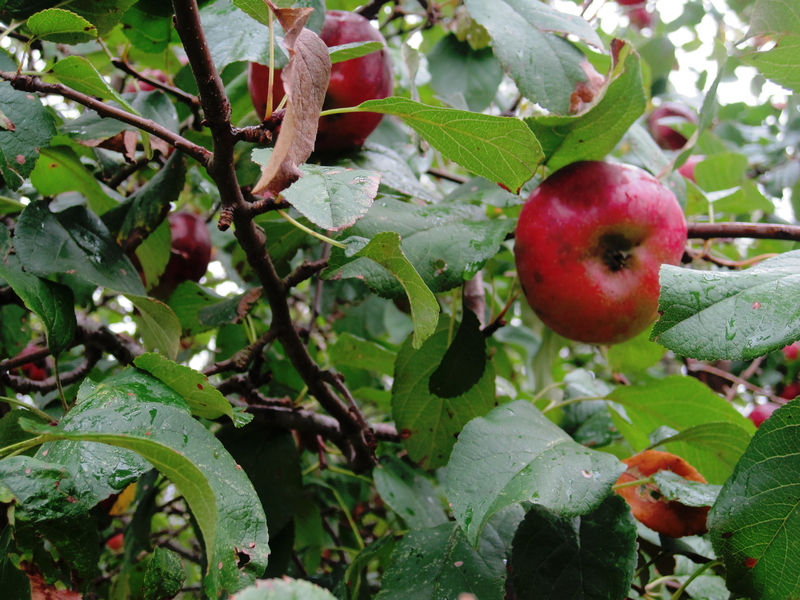 There was a time not too long ago when most land-owning folks had an orchard, or at the very least, a few apple trees (each tree was grown for a different dish, no less). 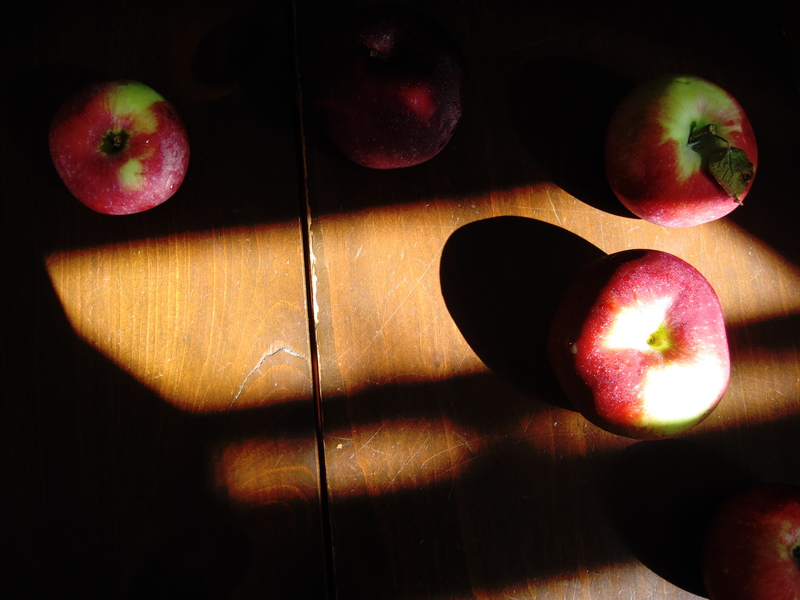 Think about the possibility that the apple you’re eating might have been grown by your great-great grandmother. It’s not only delicious…it could even be a five-sensory link to the past. Blackberries, Silverton Farms, Toms River. I can’t speak for you, but for me, supermarket shopping for produce in February is onerous at best. It’s been months since the sun made a respectable appearance, local offerings are few, and the produce from Chile is a little too coiffed, like that slicky QVC-type hawker that Bridget Jones’s mum had an affair with. * It’s like they’re trying to pretend they’re not tiny, expensive and lacking in nutrition, which was sadly lost two weeks ago over the Atlantic. The supermarket tries to keep the dismal at bay with bright lights and piped-in music, but it just makes the setting feel more hollow. ** Admittedly, the rest of the year it’s not much better. Even now, at the height of the growing season, to me it feels hollow. It might as well be February. Produce shopping at a farmers market is much more satisfying. You can buy lacinato kale that was in the ground that morning. And it’s only traveled a few miles to get to you. Best of all, you get to meet the people who grew, or baked, or somehow else concocted what they’re selling. They aren’t wearing name tags or uniforms; usually they’re in old jeans. The female growers rarely wear makeup or do up their hair. There’s a sense of integrity, of pride of ownership—a quiet brashness of what you see is what you get, refreshing in today’s endlessly tidied up and sanitized world. But for the best produce shopping experience of all, I choose pick your own. If you haven’t tried it and think you don’t want to, listen: it’s more enjoyable than you think. As long as you’re wearing shoes that can get dusty or a little muddy and you’re wearing sunblock and a decent hat to keep the sun at bay, you’re good. A bottle of water wouldn’t hurt, either. And if you go to a small farm, even better; there’s a chance you’ll have the whole blackberry field to yourself. Pick your own is a five-sense epicurian feast. Remember, farmers aren’t in it for the money. What you’re about to take part in is something ancient, something all at once enormous and humbling, something farmers—despite the labor and precarious nature of a life lived like this—treasure. The connection with the living things offering you their fruit, the gratitude, the simplicity, the peace that taps you gently on the shoulder—all are a big part of what makes this work worth it for them. And it can do the same for you, just for an hour or so one morning. See the variety in shape and color and texture of what’s growing; the sparkle of dewdrops in streaks across the grass and across your feet (when was the last time your shoes were dampened with dew? ); the sky with sun and scribbles of clouds; the geometry of the buildings, fences, plow and tractor tracks; moving, changing color in the leaves and the chickens that dot the yard; tight little immature red berries and fat glossy purple ones (to find the ripest, fattest berries, occasionally you need to lift the canes carefully and peek beneath them). Hear those chickens scolding each other; the wind rustling leaves in the maple trees a few yards off and several more yards up; the whirring of bees busy doing their thing (and won’t bother you if you don’t bother them); cicadas singing over and over again to a crescendo before dropping the note; cardinals calling to each other; the rustle of tall grass as you make your way down the path. 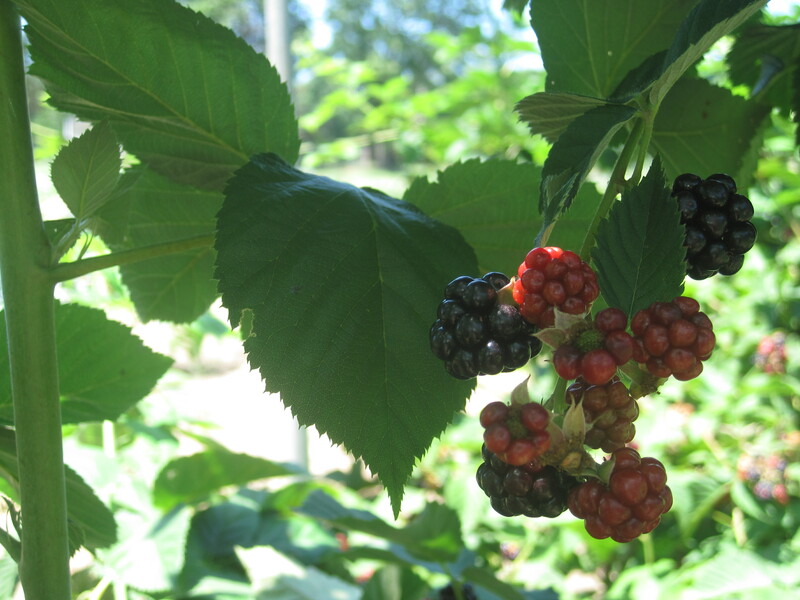 Smell the green of the blackberry leaves (yes, you can, especially on hot days); the sweet pungency of fruit that’s fermenting into schnapps after the rain dropped it to the ground Tuesday evening; the richness of the soil that crumbles like devil’s food cake; the freshness of the wind. Feel the dew on leaves growing in the shade; the basket handle under your arm; the prickly canes (being careful of the thorns; much like bees, respect is warranted); the difference between berries that are ripe versus almost ripe (you want fruit that is firm but not too firm; it should be a bit yielding, dropping fairly easily into your fingers when tugged); your blood pressure slowing down to mellow yellow. Taste the sweet blackberries, flesh and juice…as well as the gift of this morning. * Okay, he was Portuguese, but the point still stands. **Whole Foods is a notable exception. My neighbor, Mr. Cook, is to me an example of how to live. 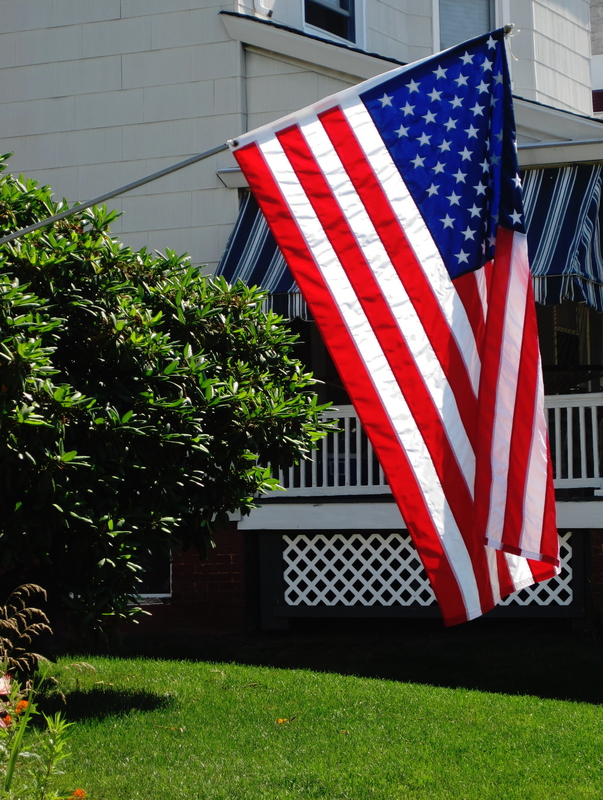 That’s his flag above, which he puts out at dawn, and takes in at dusk, every single day of the year. Mr. Cook tells me he’s lived in his house since the 1950s, when he was our tiny town’s fire chief. In those days, many of the houses along my street were home to firemen. When the bell sounded from the fire house across the street, the men would hear it and run to gear up and go. To this day, when he sees activity there, he slowly heads over to get in on it. And our fearless boys, young enough to be his kids and grandkids, treat him like a returning hero. Retired for many years now, Mr. Cook keeps active in dozens of ways. Dancing is his favorite pastime. Every spring he drives to a handful of different town halls up and down the shoreline and picks up a copy of their summer events schedule. Then he goes home, sits on his little porch in one of those white plastic stackable chairs you can buy outside the Home Depot, and details where and when all of the senior dances will be held. He never misses one, and let me tell you—as a single, mobile gentleman in his 80s, his dance card gets filled. Each morning he tells me how it went. Music, socializing? Not a big deal. To him, it’s pretty much a numbers game: ‘I danced with eight ladies last night!’ he’ll say. I think ten is his personal best. And Mr. Cook is the only one I know who doesn’t blink when I say my coffee cake contains wild mulberries that I picked myself. I really think he’s one of the last great outdoorsmen, so to him there’s nothing strange about picking fruit off a tree. He grew up in nearby Asbury Park, NJ, a seaside city flanked by Deal Lake on its north and west ends. A natural lake that once flowed from the ocean, its expansive arteries and narrow, shady fingers stretching further west must have thoroughly enchanted adventurous boys in the 1920s and 30s, with no electronics or malls to distract them. He tells me he canoed every inch of that lake. A fisherman to this day, when he was in his early 80s he regularly trekked out to Sandy Hook, about 1/2 an hour north, to teach kids how to fish. He still goes in September to pick beach plums, which he collects in a plastic grocery bag and presents to a friend who cooks them down into his very favorite kind of jelly. He also likes to bag his own turkey for Thanksgiving. The rest of us go to Shop-Rite; Mr. Cook goes to Pennsylvania. He bundles up, packs a bunch of peanut butter and jelly sandwiches, sits down in the woods, and waits. And waits. I asked why it takes so long to get a turkey, and he said, ‘It’s because they’re smart, and very fast. You move just an inch, and they all fly up into the trees.’ We think of turkeys as being slow—in the head and otherwise—because if we have any association with them at all, it’s of farm turkeys. They’ve had all the brains bred out of them, and to add insult to injury, they can no longer fly, either. But wild birds, now—everything is intact. Sharp vision, sharp minds, and they can fly up to 55 mph. Independent, adventurous, happy with the little things in life. That’s him all over. But my favorite image of Mr. Cook is one I have of him on the Fourth of July, in the evening, a few years ago. Just after dark, Asbury’s fireworks were visible over the trees south of us. I climbed out onto my roof just as they started and caught a glimpse of him on his tiny porch, on one of his white plastic chairs, watching and eating a dish of plain vanilla ice cream from Carvel.